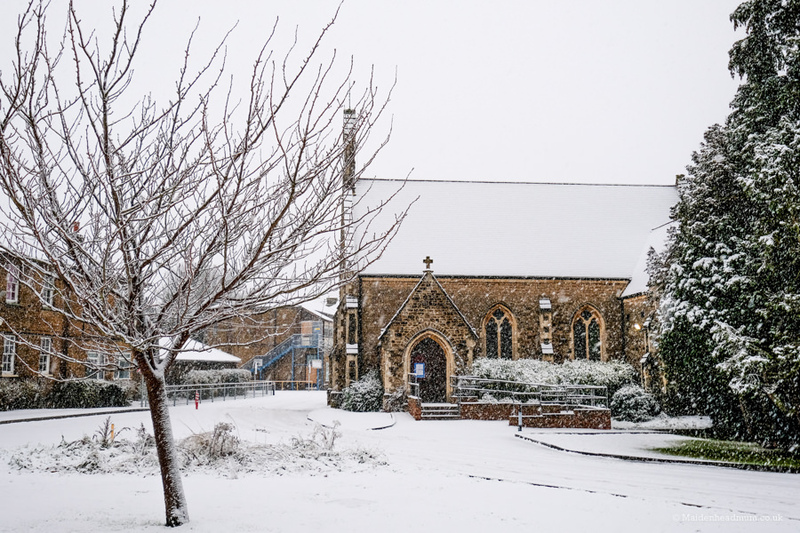 In pictures: Snowfall transforms Maidenhead into a Winter Wonderland. Living in the South East, we are often the envy of my Northern friends in the summer as we get more hours of sunshine. But the flip of that is that we also don’t get snow as often some other parts of the country. 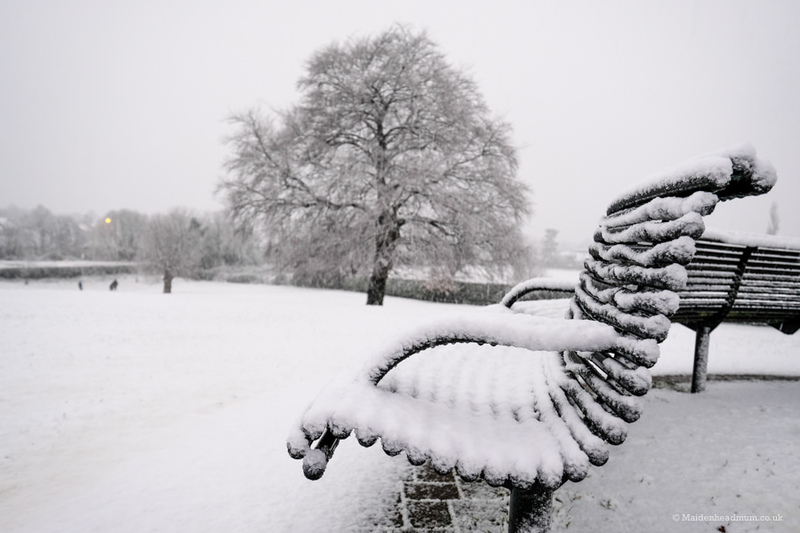 In fact, I think the last time we had some ‘proper snow’ in Maidenhead was in 2010, or 2011. 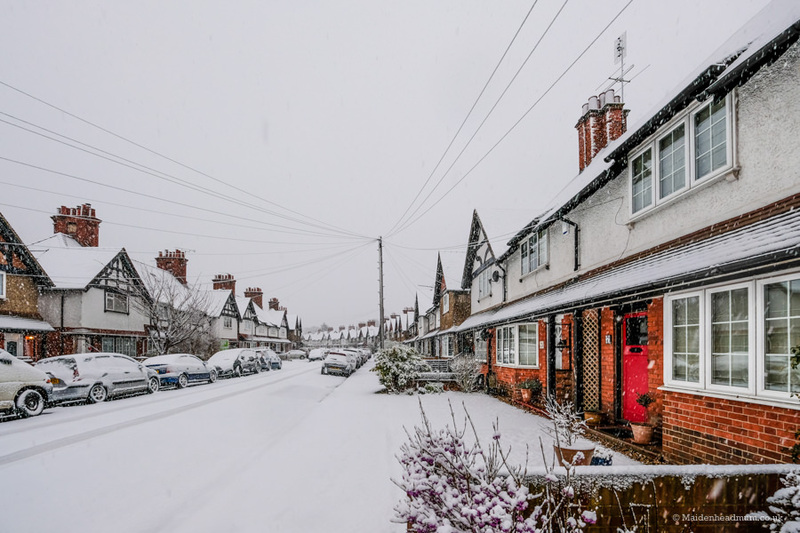 I know this because in 2012 we moved home and as our new house was right next to Boyn Grove Park (AKA Punt Hill), one of the best places to sledge in Maidenhead, I made sure that we bought a sledge so we were ready for action if the snow descended. I vowed that there would be no ‘parenting fail’ of a snowfall without a sledge in our house! Each winter since then, that sledge has been hung up in the garage UNUSED! Each year I have optimistically bought snowsuits and wellies for my young children (a new size every year! )… but still no snow! So this weekend when we woke up to a blanket of the white stuff, I was pretty excited! 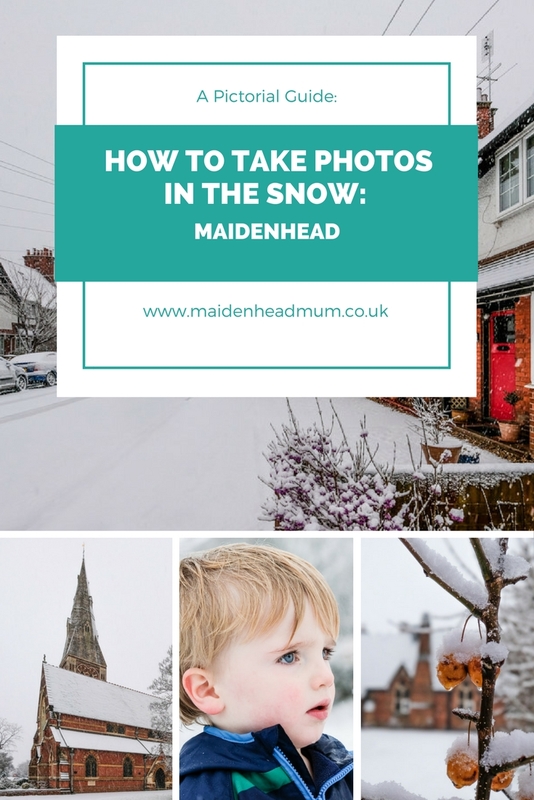 Not only was I excited for the kids and intrigued to see what my two year would make of the snow, but I was also rather excited about photographing Maidenhead in the snow. 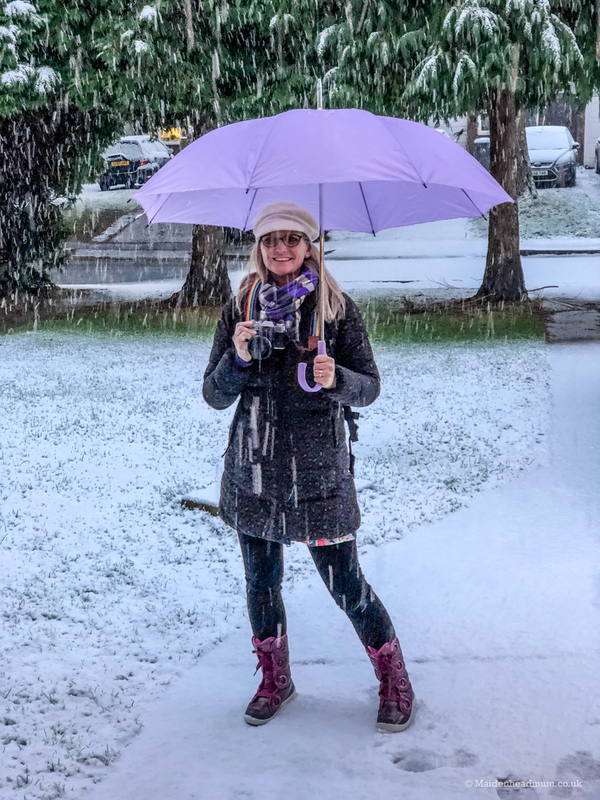 Regular readers of the blog will know that I can often be found out and about in all seasons and all weathers collecting photos for my Maidenhead calendar and the blog. The overnight snowfall seemed too good an opportunity to miss. 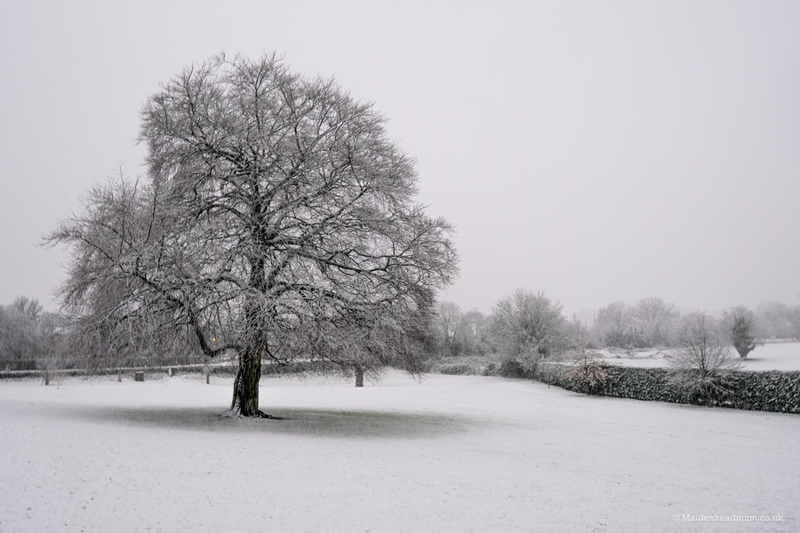 Boyn Grove Park in the early morning before everyone arrived with their sledges. Both of our kids are early risers and the weekend is no exception. So by 7am we were all up and looking out of the window. The snow was falling thick and fast at this point. I had to remind myself that although it looks soft and feathery, the reality is that it is icy cold and wet outside. But I wanted to brave it. I have snow boots and gloves and plenty of warm weather gear on standby so I decided to take a little walk around my neighbourhood, brolly in one hand, camera in the other. Whenever I’m shooting for the Maidenhead calendar, I’m quite targeted about what I shoot. 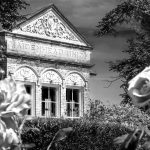 Although we have lots of beautiful places in and around Maidenhead, the challenge is to get local landmarks into the photos. Rather than just a beautiful countryside or riverside scene, I’m always keen to make sure that it’s obvious that the photo was taken in Maidenhead. Knowing that I wouldn’t want to be about in the cold too long, and also wanting to avoid driving in the snow, I chose a route that is very local to me to see what I could find. 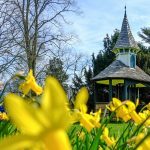 I chose some specific locations in Maidenhead, but these images will hopefully give you some inspiration of what to photograph around your local neighbourhood. Snow makes everyday items seem interesting. Look out for shapes and textures. Lots of fun things to photograph! 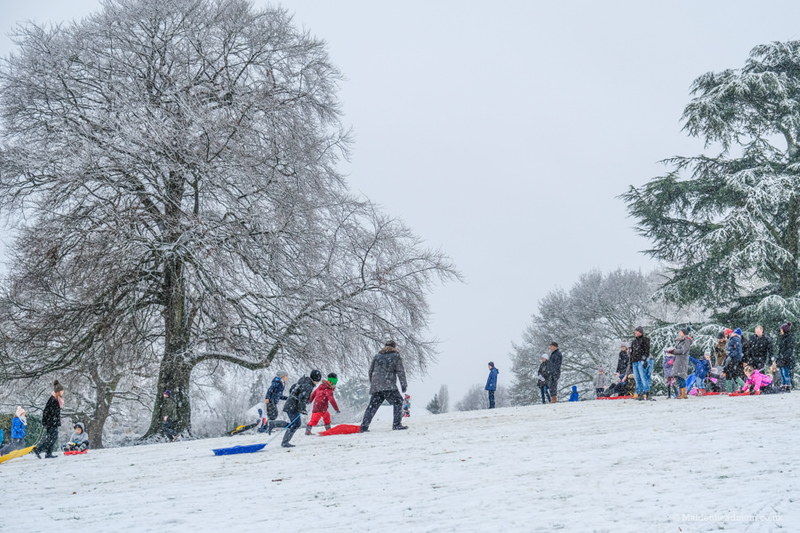 Also known as Punt Hill, this park has been the site of many a snowy sledging adventure for Maidonians across the years. 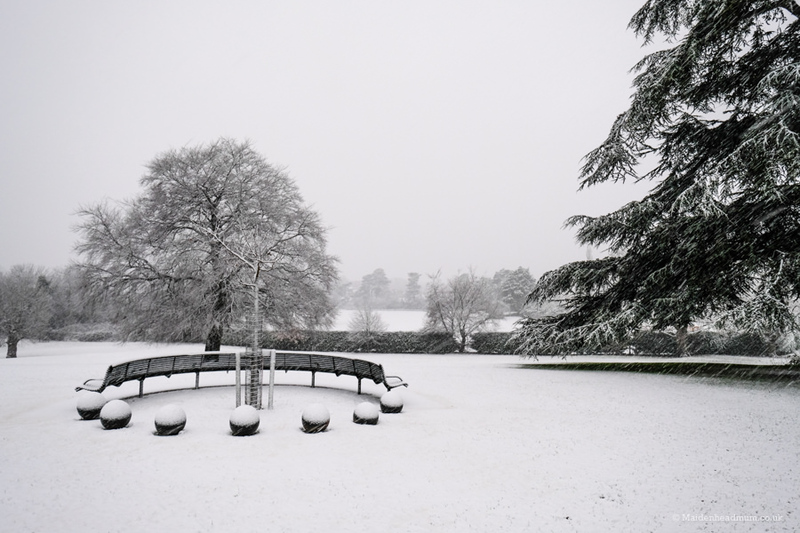 It has a fantastic hill and lovely views, so this was my first port of call as I wanted to capture some of the serenity of the snow before the chaos of the sledging action began! It has some magnificent tree’s which have stood for generations, so I wanted to be sure to capture them. I also liked how serene and surreal the playground looked! I like how this image looks like it’s in black and white, but it’s just that everything was covered in snow! 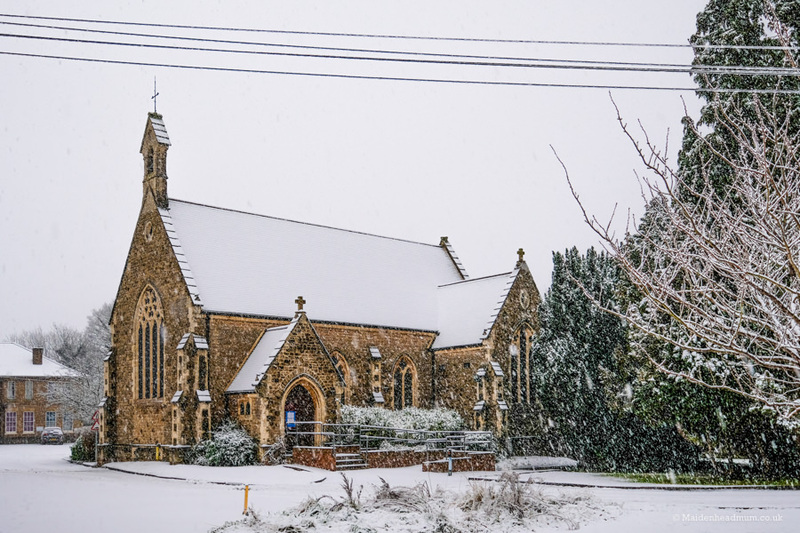 The snow covered branches made a great frame for All Saints Church in Maidenhead. This building is one of the most beautiful in Maidenhead, and it’s always a firm favourite to photograph, even though it can be a challenge to shoot because it’s so tall! I find that it’s often tricky to get a perfect perspective on the church as it is surrounded by houses. This time I had a new wide angle lens on my Fuji mirrorless camera and I was able to get all of the church, including the tower and spire into my photos. 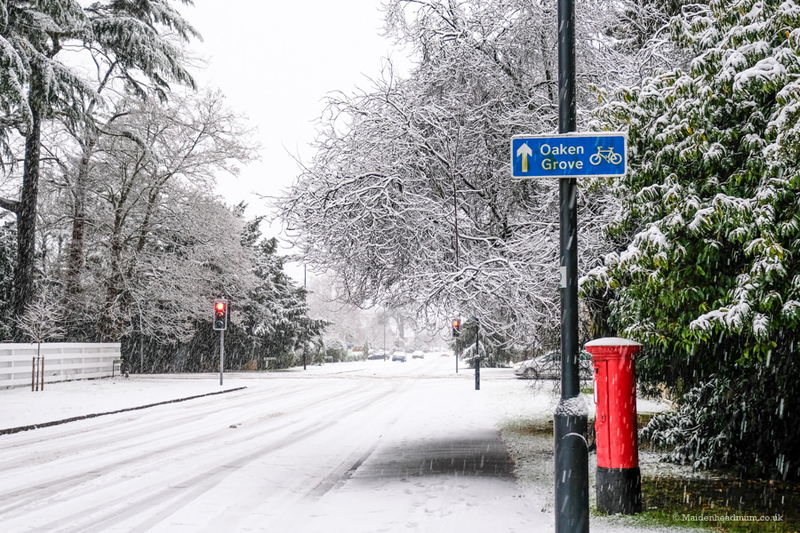 As I walked around, I spotted little flashes of colour: the postbox, some leftover autumn berries and road signs peeking out of the snow. I liked how these colours really ‘popped’ against the white background. Look for little details as well as bigger scenes: The colours of the berries matched the brickwork on the building behind. 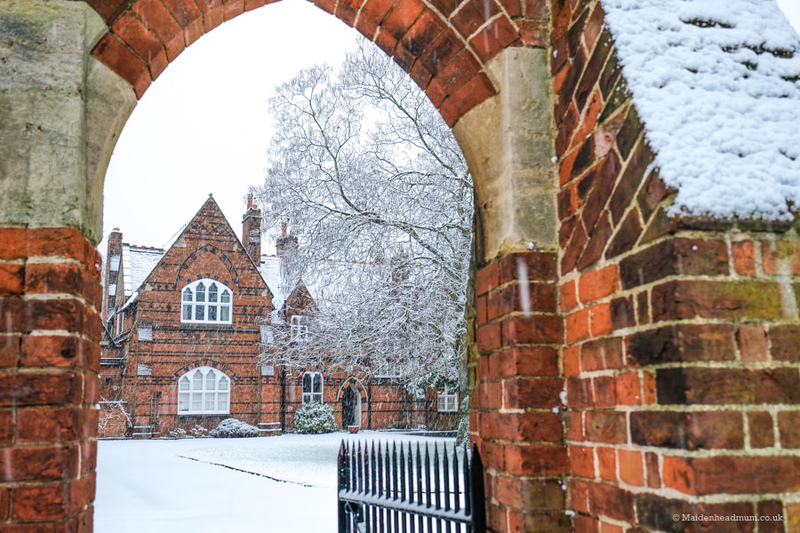 I was the first to walk into the courtyard that morning: lovely to crunch on un-trodden snow. 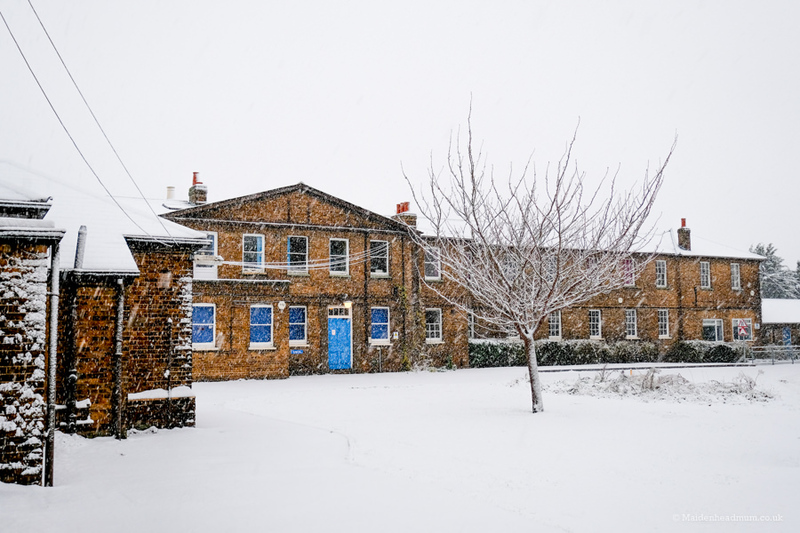 The courtyard buildings looked pretty contrasted against the snow. 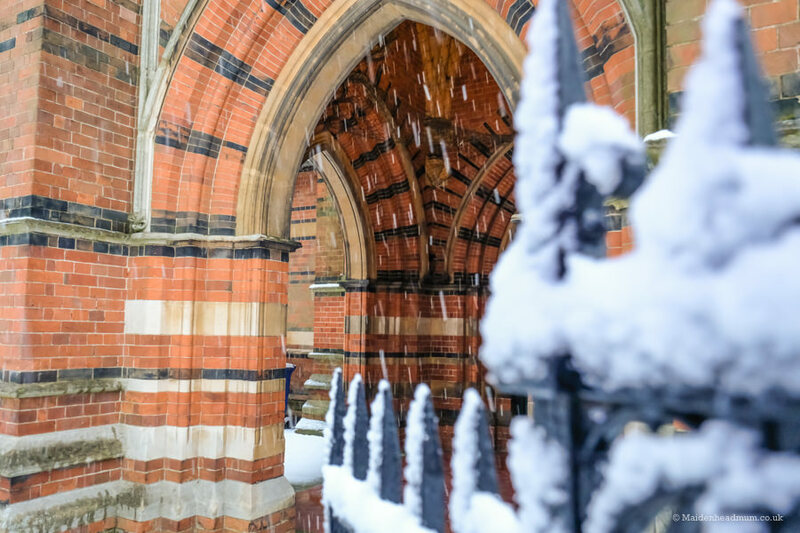 I used a slow shutter speed to capture the snow falling in this photo of the archway at All Saints. This was 1/60s, just about as slow as you can get away with when you’re holding the camera in one hand. I enjoyed capturing the flashes of colour around town. This way to St. Mark’s and Oaken Grove Park. How quiet the roads were! 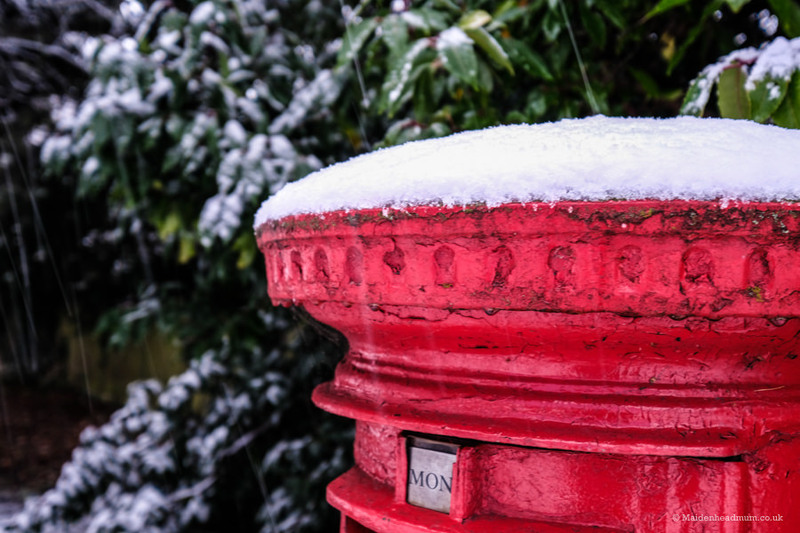 A little snowy hat on the post box caught my eye. 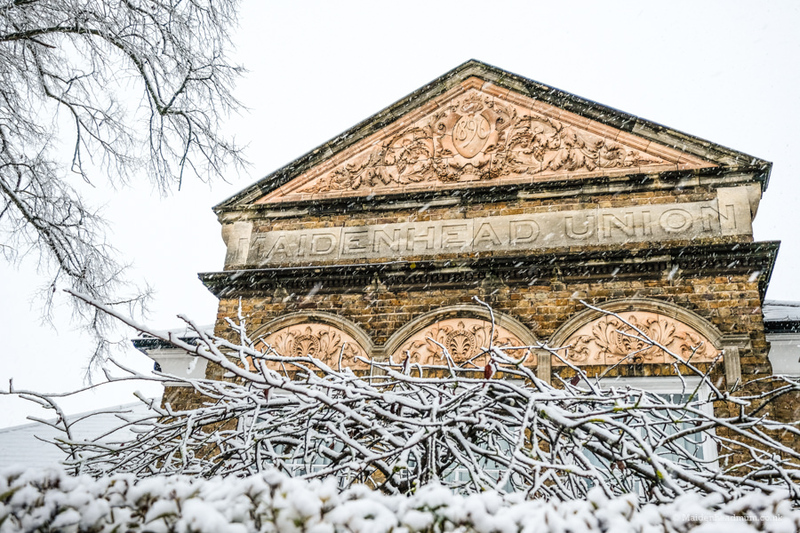 As if there was ever any doubt: definitely snowing in Maidenhead today! The hospital was very quiet on a snowy Sunday morning. You can see that the snow was falling thick and fast at this point. The tree reminded me of a Christmas Tree: it all seemed very festive. There are lots of terraced streets around Maidenhead, but Portlock is one of the prettiest. There are plenty of unique architectural features to spot on the houses. They were built at the turn of the century so their character is a little different to the standard, earlier Victorian brick terraces. I like the gables on the roof and the tiles and embellishments that you can see on top of the houses. These terracotta tiles were made in the Brick and Tile Works that used to be located up by The Golden Ball Pub and which is now National Trust land. 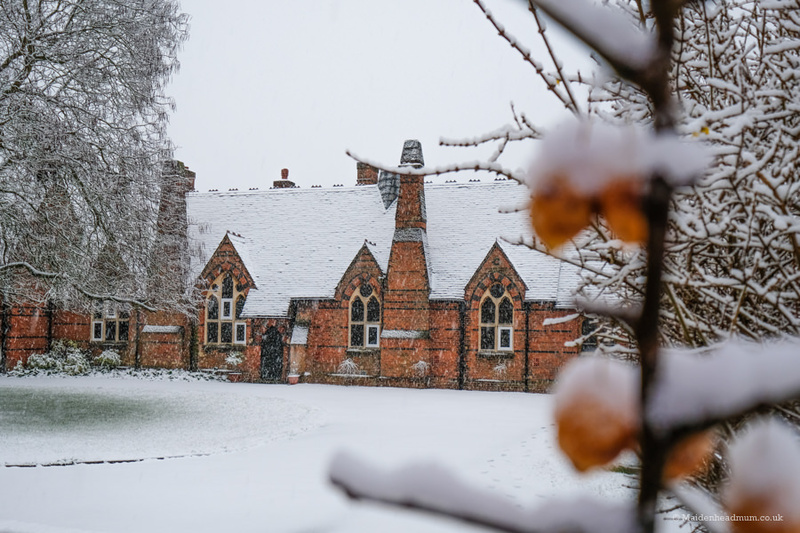 The blanket of snow seemed to make Portlock extra timeless as it took away the details that would normally distract us: the colours, make and models of the cars were largely hidden which took away the 2017 ‘visual clues’. Arriving home, I quickly became involved in the complicated ritual of ‘let’s dress the toddler in the snow gear that he doesn’t want to wear’ which was a stark contrast to the peace and quiet I’d just been enjoying. I’m not exaggerating when I say that it took at least half an hour to get the kids out of the house wearing appropriate clothes for the weather! We went over to Boyn Grove Park again, but this time the scene in front of me was completely different. I could hear the shrieks of delight before I even got to the park! 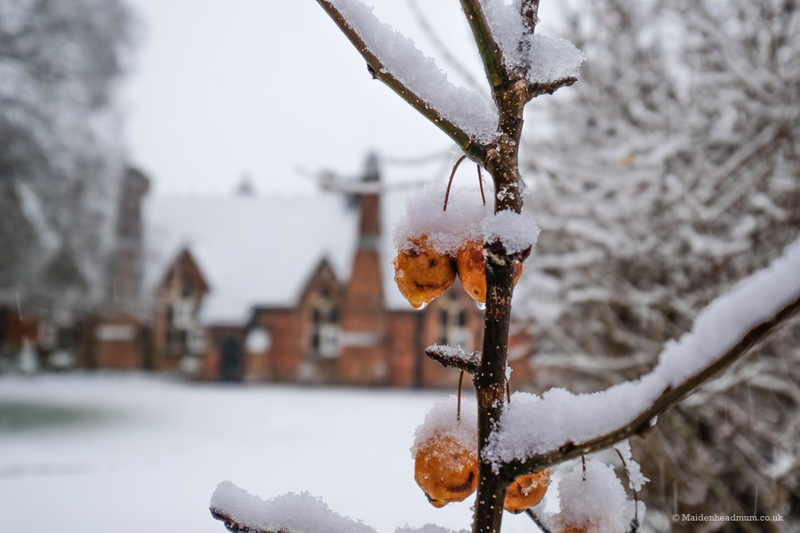 In front of me, there were grown-ups and children of all ages building snowmen, sledging and having snowball fights. How lucky to have this much fun on my doorstep! I’d switched lenses on my camera as I knew I wanted to take it with me to the park, but it needed to be small enough to tuck into my coat to protect it from the snow. Being on toddler duty meant there was no longer the luxury of a ‘spare hand’ to carry an umbrella. 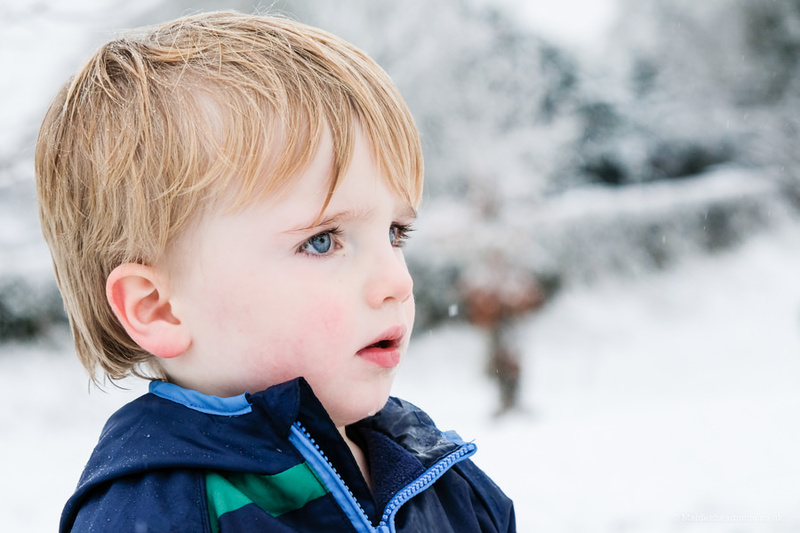 I was able to capture a few close ups of my children playing in the snow which will be lovely to look back on. Especially if we have to wait another 5 years for snow! 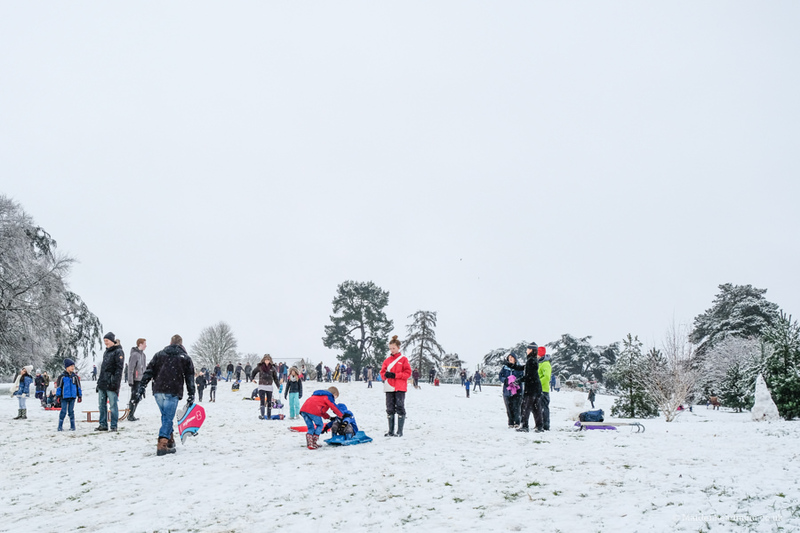 The big hill at Boyn Grove Park brings people from all over Maidenhead. How lucky that I can see it from our bedroom windows! 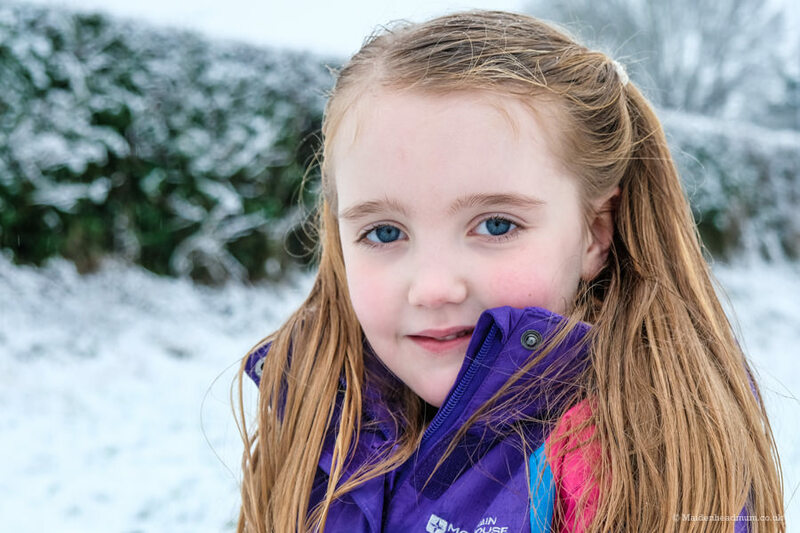 My daughter forgot her hat and her hair got wet after playing in the snow! Shooting under a snowy sky gives really flattering skin tones. It’s like using a giant softbox light in the studio. Just one hour after my previous photos, the park had got really busy! Snowboots, a puffa jacket and a giant umbrella: Ready for snow photo action! Since sharing some of these images on my Facebook page, I’ve had a few people ask me how I got the shots that I did. 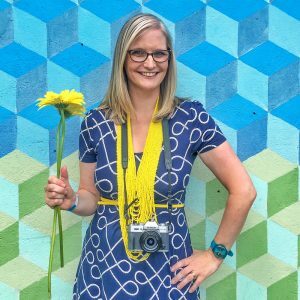 A lightweight camera is essential for snow photography, even your phone would work if you are willing to do a bit of editing on your smartphone after. 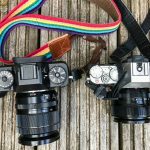 These images were all taken with my Fuji XT20 camera which is a small, lightweight camera that has all the power of a ‘proper’ camera, but in a much smaller size. This was essential as it meant I could shoot one handed while still holding the umbrella in the other hand. 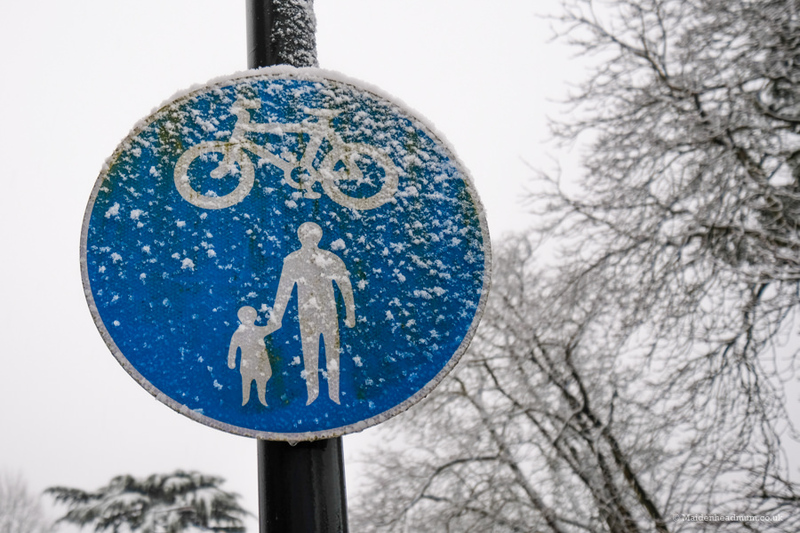 The snow was falling thick and fast and was weighing down on top of the umbrella as I walked around: I kept having to shake it off as it was making my arms ache! 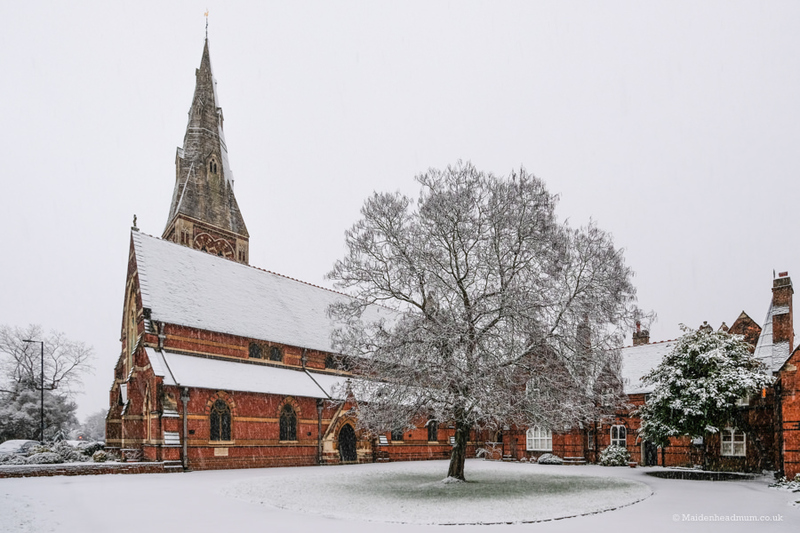 My other top tip for snow photography is that you need to be first on the scene: the beautiful smooth blanket of snow in my photos quickly turned to grey slush later in the day! 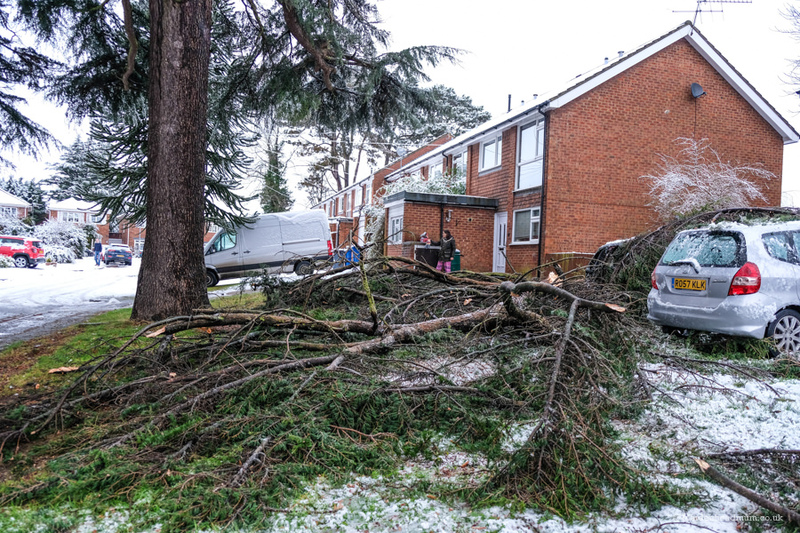 As we set off to the park, we were amazed to see that one of the big trees in our road had been a victim of the snow, with several of its branches crashing down with the weight of the snow. The little girl who lives at the house had just been building a snowman next to the tree, so she had a very lucky escape. 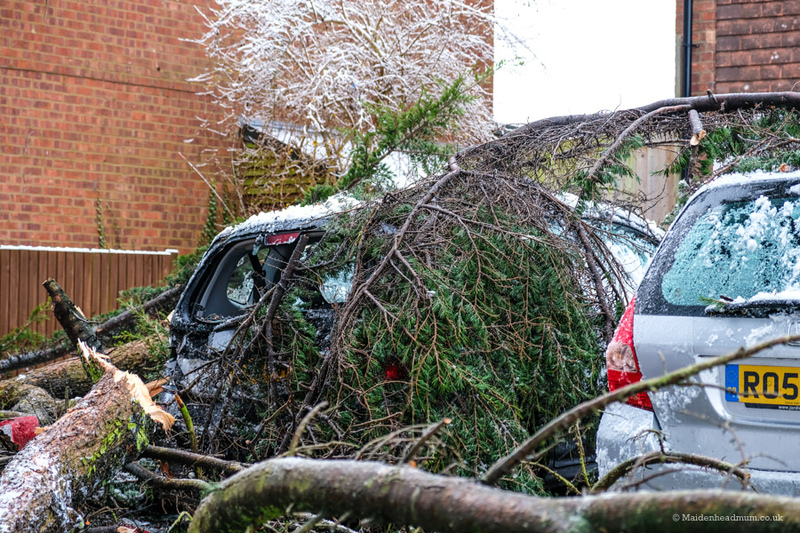 I rang the RBWM community warden for help as they have a team that works 24-7 and are often the first responders in bad weather. 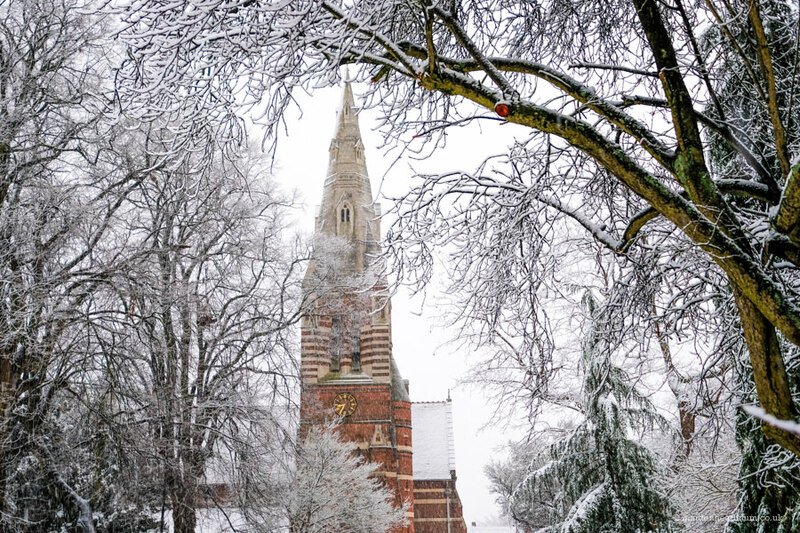 I also tweeted RBWM and was pleased to get a really quick response: just what was needed on a snowy Sunday! Some large branches fell off the tree and smashed into a car below. Click to save this post to Pinterest.